The helpful Office de Tourisme in Montignac is where you buy your Lascaux II tickets in busy months. They're helpful all year round. 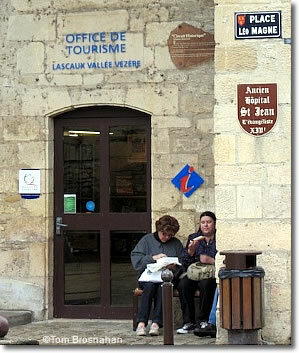 There are actually two tourist offices to help you with information and tickets to Lascaux II. The larger is right in the center of Montignac, well marked by signs (map). The other is in the village of Le Bugue, 37 km (23 miles) southwest of Montignac, 11 km (7 miles) west of Les Eyzies-de-Tayac-Sireuil (map).